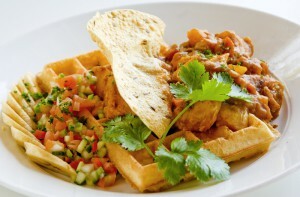 Our Chicken Curry Waffle is an all time favourite among our patrons, young and old. Generous pieces of tender white chicken are cooked to perfection in this mild, rich curry. The dish is available on our signature light and crispy Belgian Waffle or on a bed of rice if you prefer. Served with a poppadom and sambals (chopped tomato and onion and chopped banana). This deliciously wholesome dish is a perfect winter treat and will certainly chase away the winter blues.